Bill Browder and his story about the alleged Whistleblower Sergei Magnitsky. Translated from the original in German first published at Telepolis on 15 July 2018. On June 27, 2018 Bill Browder tweeted enthusiastically that he had just told his story of Sergei Magnitsky to a young Berlin audience and everyone was fascinated. 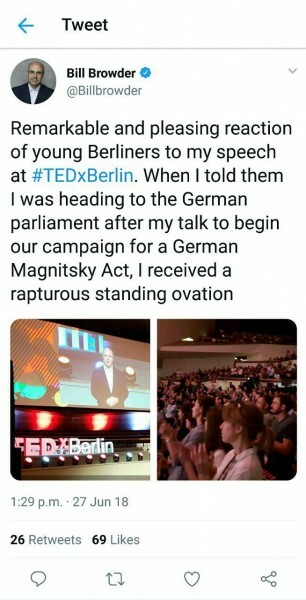 When he announced that he was heading straight to the Bundestag after the speech to start the campaign for a German “Magnitsky Act”, the audience broke into a "rapturous standing ovation". Who's Bill Browder? What story has he been telling with such success for eight years all over the world? What law does he lobby for so persistently in different countries and why? We tried to answer these questions in a film. We have concluded that the Browder case reflects today's transformation of society in an essential way. That's what our film is about. But so far it has been withheld from the public. According to our lawyer, this case is unprecedented. Despite having approved it editorially and technically, the Franco-German TV network ARTE removed this important investigative documentary from its schedule shortly before its planned broadcast on 3 May 2016. Before April 27, 2017, it had been advertised on the ARTE website with trailers. Today, one can only find some sorry traces of that in the Internet archives. One of the trailers has since been hosted by the Norwegian film festival "Movies on War" on its YouTube channel. German film title is "Der Fall Magnizki". We worked closely with the editors of ZDF/ARTE on this film. Andrei Nekrasov knew one of them from his work on the documentary series "Farewell, comrades! ", for which he received a Grimme Prize. While working on “The Magnitsky case" we did not experience any major differences of opinion, had no political arguments with the ZDF/ARTE editorial staff. The editor, who was directly responsible for the film, even demanded that Andrei use more “direct language”in his voice-over narration in the film, and say, for example, that such self-serving stories as Browder's should not be made an instrument of international politics. Everything should be called by its name. Since our documentary still can't be released, only Browder's version of the affair is known. Bill Browder used to be a hedge fund manager but now is, in his own words, one of the world's biggest human rights activists, and the self-proclaimed Putin's enemy no. 1. Bill Browder told his story to Andrei Nekrasov for the first time in an interview in 2010. Andrei wanted to make a film about it. The focus of the story was to be Sergei Magnitsky, Browder's lawyer, as Andrei believed at the time. Browder was the head of the Hermitage Fund that used to be one of the largest investment funds in Russia. In 2007, police searched his Moscow offices. According to Browder, there was no reason whatsoever for this. He then hired Sergei Magnitsky, the best lawyer in town (according to Browder), to find out what was going on. Magnitsky is said to have thoroughly investigated everything and allegedly found out that the same police officers involved in the search had carried out a huge financial fraud. With the help of the confiscated company documents, they allegedly arranged a spectacular illegal tax refund. The Russian tax authorities had transferred $230 million to the fraudsters. Magnitsky allegedly uncovered this and reported the crime to the authorities. A month later, Magnitsky was arrested, according to Browder, by the same police officers Magnitsky had exposed. Browder claims that they tortured Magnitsky in prison daily for a year, trying to get him to retract his accusations of the police. Magnitsky refused, and as a result, on 16 November 2009, he was beaten to death with rubber batons by eight riot guards in a Moscow prison cell. We often feel impatient with those who still believe in that story today, but in the end one can understand them. After all we were deceived, too. The implied moral of Browder's fable is that there is still a place for fearless honesty and heroism in the capitalist financial world and that unconditional virtue can still defeat ubiquitous greed and cynicism. Browder speaks of Magnitsky, as if he’s "almost like a god" and – despite the torture – did not give in. Indeed there is no comparable figure known in contemporary history who has literally been "tortured for 358 days" without giving in. Unfortunately, it is still often the case in Russia that people are put behind bars for questionable reasons, and numerous human rights organisations, NGOs, opposition parties and the mass media see it as their task to make such cases known to the public. The cases of Khodorkovsky, Nadia Savchenko, Oleg Sentsov and others have been widely reported. Some whistleblowers from the financial world have been prosecuted, e.g. Hervé Falciani, Bradley Birkenfeld and Rudolf Elmer. In these cases, as with Magnitsky, there was a talk of a lot of money and there was a dispute about the whistleblowers’ motives, but at any rate, such stories always attract public attention. The world, however, did not hear of Sergei Magnitsky the whistleblower, either at the time of his alleged sensational revelations or even after his arrest, because Browder only came up with the idea of declaring him a whistleblower hero after his death. Sergei Magnitsky’s supposed ‘heroic act’ only became known after his death. Browder told Andrei in the 2010 interview that he had automatically received a copy of each of the 450 complaints Magnitsky allegedly filed while in custody. This means that Browder should have known a lot about Magnitsky’s daily torture, but didn't inform anyone and didn't do anything about it. He did not go to the well-known human rights organisations such as Amnesty International or Human Rights Watch and he did not contact the Russian NGOs with a reputation in the West such as “Memorial” or the Moscow Helsinki Group. Zoya Svetova, a prominent Russian human rights activist who covers Browder's back today wrote in a 2014 article for Khodorkovsky’s site "Open Russia": "I knew nothing about Sergei Magnitsky. I didn't hear from Hermitage Capital either. We also visited Butyrka prison, (...) but we were not asked for help by Magnitsky's lawyers." Magnitsky's 450 complaints were never published. What is presented to the public as "Magnitsky's Diaries" is a 44-page handwritten document, dated September 20, 2009 (less than two months before his death). Magnitsky lists 25 complaints he filed at Butyrka Prison between 26 July and 18 September 2009. He writes that some of them remained unanswered, some were rejected and some of the complaints were acted upon – albeit belatedly. For example, on 14 Aug 2009 he requested medication from relatives. There was no answer but he received the medicine on 4 Sept 2009. He requested a water heater on 26 Jul 2009 and received it on 31 July 2009. He asked for a TV and a refrigerator six times, twice for the permission to copy some documents, seven times for repairs in the cell. He applied to get a nail clipper from relatives and the Civil Procedure Code from the prison library. A broken spoon, cup and a torn blanket were replaced and he also got a hair clipper from his relatives. The cell’s windows were repaired in September. What Magnitsky describes are numerous violations of rules and rights, negligence and other adverse experiences of imprisonment in Russia, but not torture. What is widely unknown is that, until 25 July 2009, Magnitsky was accommodated in a “VIP” prison wing, number 99/1 of "Matrosskaya Tishina", which is specially intended for "prominent prisoners". Best known are the famous mafia boss Vyacheslav Ivankov nicknamed "Yaponchik", the 1991 putschists, the Minister of Atomic Energy Yevgeny Adamov, the FSB colonel Mikhail Trepashkin, the former colonel of the military intelligence service Vladimir Kvachkov, Russia’s most famous contract killer Alexander Solonik and the oligarch Mikhail Khodorkovsky. It's strange that Bill Browder didn't sound the alarm if Sergei Magnitsky was indeed tortured every day. Browder has been known as a gifted and keen manager of public communications using every arising opportunity. In October 2009, 11 months after Magnitsky's arrest and one-and-a-half years after his first alleged exposing testimony, Hermitage Capital posted a professionally produced video about a $230 million tax theft on YouTube. The arrest of a "lawyer and accountant" is only briefly mentioned at the very end, not a word about the torture, nor anything about Magnitsky’s alleged heroic exposing of the tax theft. For a long time we did not pay attention to the inconsistencies in this story. On the whole, the struggle for human rights in Russia, which seemed to be supported by such people as Bill Browder, was more important. The inconsistencies, however, accumulated. The decisive turning point came during Andrei‘s last interview with Browder in March 2015, when Andrei still hoped his doubts could be convincingly resolved. Who was the first person to report the $230 million tax fraud? Surprisingly, in front of the camera, Browder couldn’t remember who it was, despite the fact he had made Magnitsky famous all over the world for being just that person. What was wrong? Why couldn't Browder answer a specific question? Wikipedia, countless media reports, a European parliamentary inquiry and Western governments all insist that Magnitsky independently uncovered the crime, investigated it thoroughly and then courageously brought charges against high-ranking officials, for which he paid with his life. That's the big – Browder’s – story. But where are the documents detailing Magnitsky's investigations and conclusions? Where is his criminal complaint with all the records and evidence of how and what exactly he uncovered? The criminal complaint does not exist. There are no records of the alleged investigation. There's not a single piece of evidence that Magnitsky was investigating any crime. 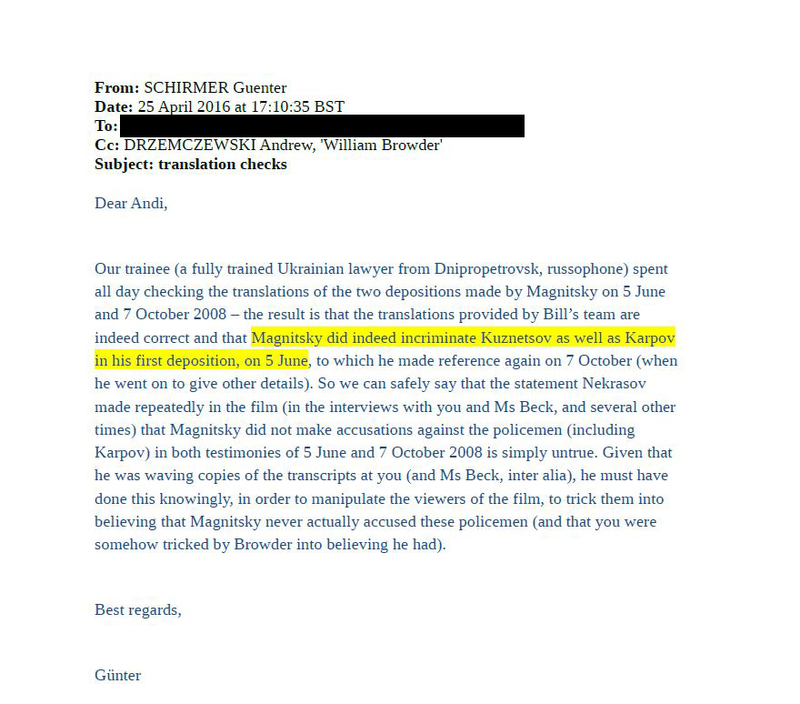 Browder has essentially presented nothing to the public except two "testimonies" by Magnitsky dated June 5 and October 7, 2008, to which he always refers. "Anyone who claims that Sergei Magnitsky did not uncover the crime before he was arrested is simply trying to whitewash the role of the Russian government." And on top of that came a warning, if not a threat, that Andrei should "be really careful" if he were to doubt Sergei Magnitsky's status of whistleblower. The so-called testimonies dated June 5 and October 7, 2008 are at the heart of the Magnitsky case and our dispute with the Western political establishment and the media. The unbiased reading of these interrogation records reveals that Magnitsky had not accused anyone of the tax fraud. His language can sometimes appear disagreeable. That can be explained: Magnitsky felt he was a suspect and was defending himself. In our film, we show the context within which Magnitsky was questioned and what Browder has kept secret from the public. It took two years of research to establish the context. The result is a two-hour film in which we try to explain the complexities of the Magnitsky case in a way relatively easy to understand. Most of our opponents prefer an easier way: simply letting Browder's PowerPoint presentation guide them in the "right" direction. On 5 June 2008, Magnitsky was not summoned for the first time. As a tax consultant and accountant specializing in tax optimization for foreign investors, he was responsible for Browder's offshore companies’ accounts in Kalmykia (then a tax haven inside the Russian Federation), and had been known to police investigators since 2004. He was suspected of abusing tax benefits and being involved in tax evasion. Magnitsky confessed in a 2006 interrogation that he was "probably" the director of "Saturn Investments", Browder’s shell company suspected of tax evasion. Prior to Magnitsky, Bill Browder himself was the director of Saturn Investments and of another shell company, Dalnaya Step, which filed for bankruptcy in 2004 while still owing taxes to the state. Browder and Magnitsky were prosecuted in this same case. Browder was convicted in absentia in 2013, the prosecution of Magnitsky was discontinued. The alleged posthumous conviction of Sergei Magnitsky is one of many Browder inventions. Magnitsky was also summoned twice in 2007 in the investigation of tax evasion at "Kamea", another Browder company. 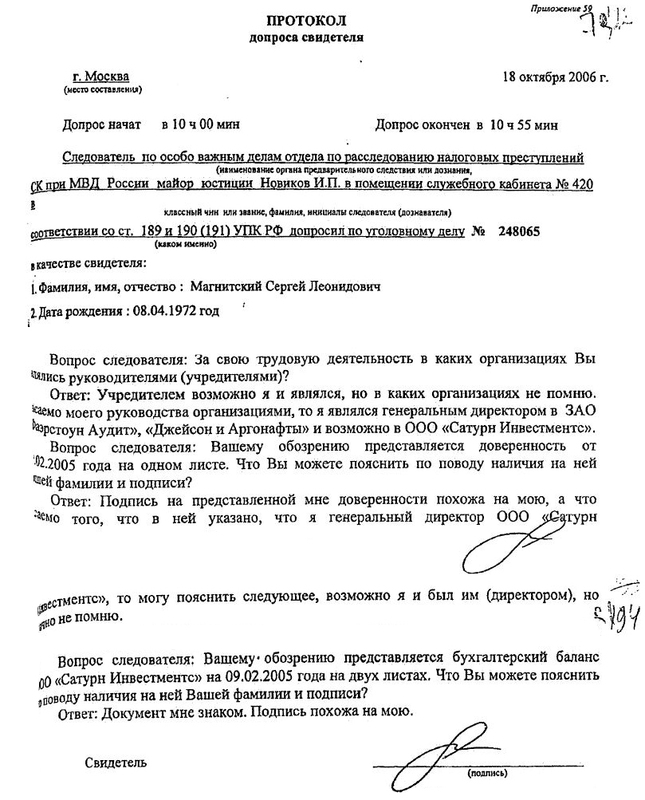 Of Magnitsky's numerous police summons, Browder mentions only those on June 5 and October 7, 2008 but refers to them as whistleblower’s “testimonies”. 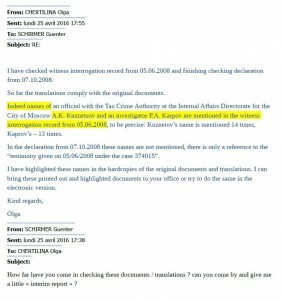 In reality, on June 5 and October 7, 2008, Magnitsky had tried to avoid answering investigators’ specific questions. He makes vague, convoluted and often misleading statements. This becomes immediately apparent when one fills in the gaps in Browder's story. Our opponents have compiled quotations from both documents according to Browder's PowerPoint template, and so support Browder in his campaign. In that respect Andrei gave his opinion to the US Congress. In our first interview, Browder describes the post-Soviet privatisation as a "win-win situation": The state gave away all "the shares of all the companies to the people for free”. Everyone could have made a lot of money out of it, Browder claims. When he personally experienced difficulties with Russian tax investigators and could no longer make bumper profits, good Russian capitalism suddenly came to an end. Since then, according to Browder, an era of complete corruption and human rights violations has dawned in Russia. For most Russians, the rush for communist property was a kind of "controlled civil war" overseen by the IMF, the “Chicago Boys” from Harvard, Goldman Sachs and others. The majority of the population was the loser. Magnitsky was certainly the victim of unforgivable medical negligence and the Russian penal system, but he also fell victim to the post-Soviet gold rush of privatization, which enriched Browder and his foreign investors. Browder and his helpers skilfully control the Magnitsky narrative with PowerPoint presentations, which they regularly adapt to the course of events and spread among the allies and the unsuspecting public through various channels. The unhinged use of Browder’s private press releases as relentlessly efficient political combat weaponry, says a lot about the corporate media spreading unverified, copypasted information. After the cancellation of the film’s premiere at the European Parliament on 27 April 2016 and the film‘s withdrawal by the ARTE on 3 May 2016, Bill Browder published two press releases. 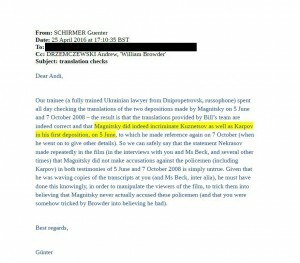 One was on 9 May 2016 alleging the “French channel ARTE” had officially informed Browder that it is cancelling the "anti-Magnitsky propaganda film” and had “no intention to show it at any point in the future”. The second press release on 16 May 2016 said that the German TV channel ZDF had just confirmed to Browder that the film would not be shown. There were no references to an official statements from ZDF/ARTE (ZDF and ARTE not being separate entities for the purposes of our film’s broadcasting) nor any other piece of evidence. Our producer Torstein Grude of Piraya Film didn't get any official notification from ZDF/ARTE with regards to the cancellation of the transmission. The TV channel was as silent as the grave and did not react to the press reports. Only when we inquired did the editor responsible for the film reply by email: "As long as the legal review continues, there is no reason or need to make any further comments." After the publication of the second press release, we only received an automatic reply from the editor: "I am currently out of office. In urgent cases, please contact my assistant." Whether Browder was lying about the permanent cancellation or somehow communicating with ZDF/ARTE behind our backs remains a mystery. At the time, we assumed that ZDF/ARTE would join us in advocating freedom of the press, and that we would be fighting back together. That didn't happen: ZDF/ARTE completely withdrew themselves and left us exposed to a massive attack. On 13 May 2016, Frankfurter Allgemeine Zeitung (FAZ) published an interview with Andrei Nekrasov. The interview was accompanied by an article by Kerstin Holm in which she pillories Nekrasov, saying it was disingenuous to portray Browder's "well-documented story" as fiction, when everything had already been proven. She referred to the "Novaya Gazeta", which, as is shown in our film, works closely with Browder. Bernd Fabritius – then the first deputy chairman of the Legal and Human Rights Committee of the Parliamentary Assembly of the Council of Europe and a member of the Bundestag from CSU – responded on his website on 24 May 2016 "to the disinformation campaign against the report of the Parliamentary Assembly on the Sergei Magnitsky case”, where he accused Andrei of "spreading false statements of fact" and thanked the editors of ARTE and ZDF for cancelling the film. "A clear case: Nekrasov is accused of propaganda." This is what FAZ wrote on Twitter on 27 May 2016 about the article by Michael Hanfeld (features, online and media editor), in which he refers to the Green politician Marieluise Beck, Bernd Fabritius and Bill Browder, all of whom call the film "blatantly untruthful". They also claim that the Council of Europe rapporteur worked independently of Browder’s sources. They state further that the transcripts of Magnitsky‘s interrogations, the testimonies dated 5 and 7 October 2008, do incriminate the police. These are the same “testimonies”, or witness statements in a Russian criminal investigation, that Browder made available to the Council of Europe, and which we discussed at length above. On June 17, 2016, FAZ published an article by Andreas Gross, the special rapporteur on the Magnitsky case, for the Parliamentary Assembly of the Council of Europe. Mr Gross claimed that Andrei Nekrasov had been manipulative with him by shoving Russian language documents into his face, calling them Magnitsky's interrogation transcripts, and then asking him in an unprepared state some detailed questions which he was unable to answer after such a long time since working on his report. The truth is, however, that Mr Gross did say clearly in front of the camera that the key documents, such as Magnitsky's interrogation records and their English translation, were provided by Browder. We were under the impression that Andreas Gross had not read these English translations in detail, since he did not know any more about the content than what had been written in the short summary on Browder's website, namely that Magnitsky had accused police officers Karpov and Kuznetsov of a “company theft” and the illegal tax refund. Andrei read these interrogation reports a dozen times, studied them thoroughly and found nothing even close to a report of a crime allegedly uncovered by Magnitsky, and allegedly committed by the police officers in question. In order to help Mr Gross, Andrei ran him through the actual content of these documents. He still couldn't say more about it: "I can't help with this detail, but perhaps you can call Günter Schirmer." Günter Schirmer, Secretary of the Legal Committee of the Parliamentary Assembly, "a very experienced German judge", as Marieluise Beck recommended him to us, co-authored this report. Unfortunately, Mr Schirmer did not want to be interviewed. From the emails leaked in 2017, you can derive the sense of how hectic things became after the film premiere was announced in the European Parliament. 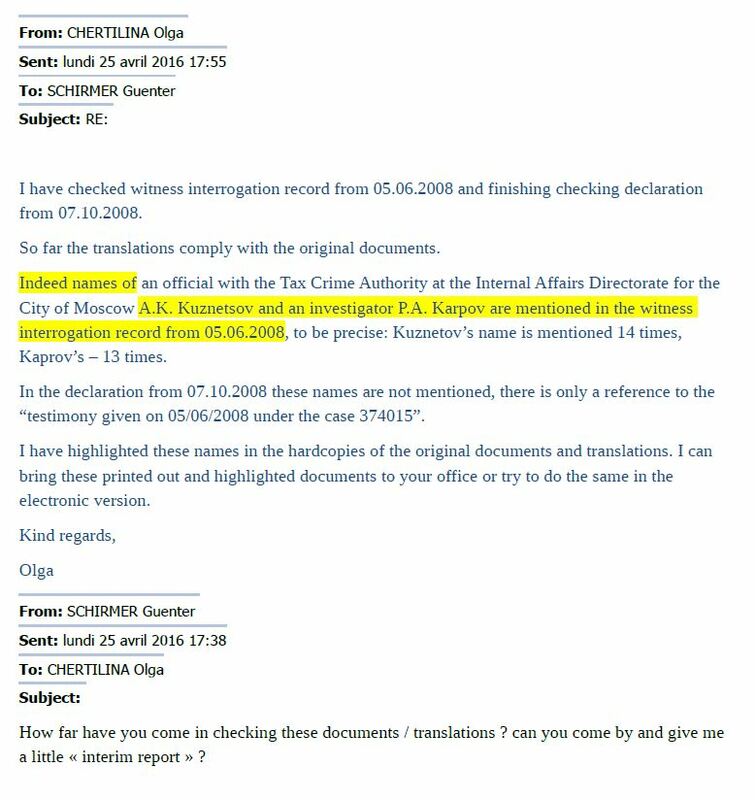 Günter Schirmer had the translations of the two “Magnitsky testimonies” urgently reviewed. A Ukrainian employee writes: "Indeed names of (...) A.K. Kuznetsov and an investigator P.A. Karpov are mentioned in the witness interrogation record from 05.06.2008, to be precise: Kuznetov's name is mentioned 14 times, Kaprov's - 13 times." As an experienced judge, Mr Schirmer should know the difference between a "mention of the name", as his Ukrainian associate wrote, and an "accusation". Magnitsky mentioned many names during the interrogation on 5 June 2008, including those of Browder's colleagues Ivan Cherkasov (10 times), Vadim Kleiner (8 times), Eduard Khareitdinov (6 times) and Browder's sham directors Paul Wrench (11 times) and Martin Wilson (12), among others. What he does not mention is the tax theft amounting to $230 million. 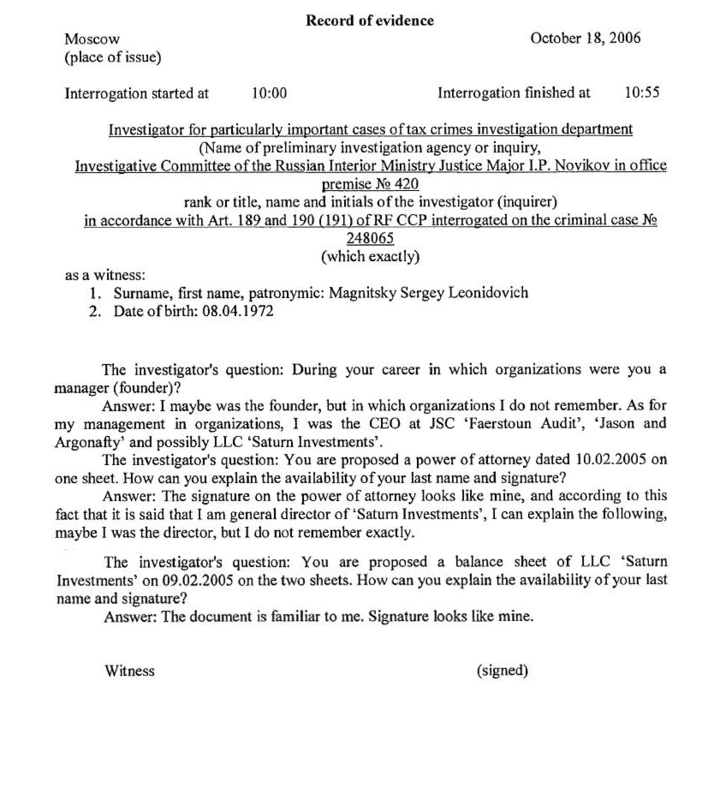 Magnitsky does not accuse police officers Karpov and Kuznetsov of the tax theft either on 5 June or 7 October 2008 and does not even mention their names during interrogation on 7 October. It is extremely difficult to believe that such a manipulative confusion of terms was unintentional. Andrei has carefully studied the report of the Parliamentary Assembly of the Council of Europe, which proved to be biased and incomplete. In this "independent" report, Andreas Gross borrows Browder‘s arguments in their entirety, taking advise and documentation from Browder‘s team. Browder builds his main argument on the assertion that the reason for Magnitsky‘s arrest, torture and murder was his report of the tax rebate theft he had investigated, accusing the police officers of pulling it off. Magnitsky‘s alleged accusation of the officers was, according to Browder, their motive to imprison and kill Magnitsky. However, if you read the interrogation minutes carefully and without prejudice, you will see that it was not a report of crime, a criminal complaint detailing an investigation, not to mention any evidence that would seem dangerous to some corrupt police, and motivate them to persecute Magnitsky. As mentioned above Magnitsky had been the subject of police investigations since 2004 as a tax consultant and accountant for Browder's numerous shell companies that were suspected of tax evasion. Before Magnitsky's summons in October 2008, the Russian press had already reported extensively about the 230 million tax refund fraud and about the police investigation of the case (10.04.2008 "Izvestia", 24.7.2008 "Vedomosti", 25.08.2008 "Kommersant", 23.09.2008 "Delovoi Vtornik"). The name Magnitsky does not appear anywhere. Even Bill Browder talked about the $230 million on the radio station " Echo Moscow" at the end of July 2008, without mentioning Magnitsky or any of his heroic revelations. So, a major fraud took place, which was then reported in the press and which was under investigation for months. An accountant was summoned for questioning because he was in charge of the shell companies to whose accounts the $230 million was reimbursed. 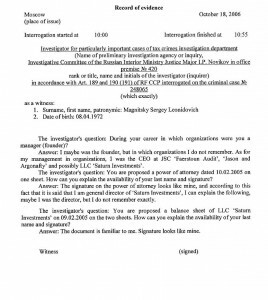 Magnitsky, the accountant, mentioned in one sentence a "theft of funds from the state budget" because the investigator had asked him about it. In a very long and winding sentence, Magnitsky said that this theft was discovered by a lawyer named Khareitdinov. The comments were mainly about defending Khareitdinov, a member of Browder's team, who was suspected of a fraud. In other words, Magnitsky tried to divert suspicion from himself and his colleagues. In any case, he did not talk about his own investigation of the tax rebate fraud and did not accuse the police officers of it before being arrested. Imagine how this would be seen in the West: shell companies of a large hedge fund are suspected of being used in a financial fraud and the management concerned takes a sentence and a suitable word out of an interrogation of its suspected employee and claims it to be an undisputed proof of the employee’s heroic whistleblowing, a detailed investigation of the affair and a substantiated accusation of the police investigating the case. In the West, such "evidence" would be met with derision. But when it comes to Russia, that is good enough as an alibi for a suspect in an alleged international white-collar crime. It is quite astonishing that the Parliamentary Assembly of the Council of Europe, evidently marked by prejudice and arrogance, accepts such incompetence and, what is worse, acts under the undue influence of a powerful hedge fund manager suspected of having committed economic crimes. Since the publication of Andrei‘s reply to Gross' opinion piece in the FAZ was rejected by the editorial office, he had the last word on the question of whether Magnitsky had accused the officials. But then, unexpectedly, Mr Gross had a problem with this report in the USA. The Prevezon case had become better known in the USA than the Magnitsky affair itself. In 2013, Browder filed a lawsuit against a company called "Prevezon" alleging that it had benefited from the Magnitsky affair, which led to legal proceedings. In similar cases, Browder has accused several companies in several countries of allegedly having received parts of the stolen $230 million. Then he turned out his press releases, where he claimed to have followed the money from the Magnitsky affair here and there. If Browder has found the stolen money, then finally his story should be perfect from A to Z! In reality in no court in the world has Browder proven that he had tracked down the Magnitsky fraud money. Unexpectedly for Browder, the owner of Prevezon, Denis Katsyv, denied all guilt, and went into counter-offensive to defend his reputation with the help of a team of top American lawyers. Bailiffs ran after Browder for one and a half years to hand him a subpoena. When he finally had to give witness statements under oath in court - he often looked, in the video record of his deposition, like a defendant. During this interrogation it turns out that several key points of his Magnitsky story are simply not true. "There's no evidence that an actual hearing with the appropriate procedural safeguards was actually conducted. Finally, the inception of this report appears to have been predicated on a series of events that bring into question certain motivational problems. The Gross report cites "earlier work" of the assembly regarding Magnitsky's death. One of the events that may have colored the investigation from the outset is William Browder's interference with the assembly's work. In June 2011, it appears that Browder "made an intervention at a parliamentary seminar" at a meeting of the committee that ultimately authorized Gross's involvement in conducting his investigation. Further, the Gross report is replete with statements from witnesses that are sympathetic to Magnitsky and Browder, among others. There's several individuals who were paid and directed by Hermitage to investigate Magnitsky-related events who were interviewed by Gross. German public broadcasters have the task of ensuring diversity of opinion by not being bound by economic or state interests. Diversity of opinion and independence are seen as paramount. "This independence must be preserved against attempts to exert influence. ", according to the German public broadcasting charter. How can ZDF/ARTE explain their refusal to show the independently produced documentary "Der Fall Magnizki", which they editorially approved? The film was censored under pressure from a powerful American hedge fund manager. 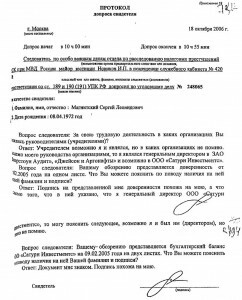 In their lawyers' letters, ZDF/ARTE do not assert that Nekrasov’s claims in the film are factually false. They could have hardly asserted that - the film‘s investigation was approved by the TV editors. The main reason for the cancellation of the film is that we refused to completely remove the presence of Bill Browder from the film. He withdrew his consent retroactively after realising that the film had not turned out in his favour. The request to leave him out of the film is absurd, since Bill Browder is at the centre of the story and the investigation. Generally no investigative journalism would be possible if such requests were considered legitimate and were enforced. No one has sued us so far. This is also not necessary if one simply has the power to prevent a filmmaker or a journalist from publishing their work as planned. Unfortunately for Browder & co. their are people like yourself, Andrei, who dig deeper & and have the conscience & fortitude to do the inspirational & right thing. Unfortunately Browders lies are still unknown to most of the world. If you see the movie and read Andreis narrative it's unbelievable that people still believe Browders lies. I wish Andrei lots of strength to continue his quest for the truth and I will personally spread his narrative as much as I can to my friends and family and around the internet.